TOKYO (DP) - The youth market for off-road motorcycles is growing, and looks set to do so for the foreseeable future. These days riding off-road, in trail parks, motocross tracks or even back yards, can be very much a family activity that involves everyone. It's also a great, and enjoyable, introduction to motorcycling and readily builds skills and machine control, so useful later on whether out on the road or in competition. For Honda, acquiring young riders early in their careers is a great introduction to the brand, its core values and most importantly, its motorcycles. The new CRF110F takes over the place of honor long held by the popular CRF70F among Honda's family of fun, entry-level off-road bikes. 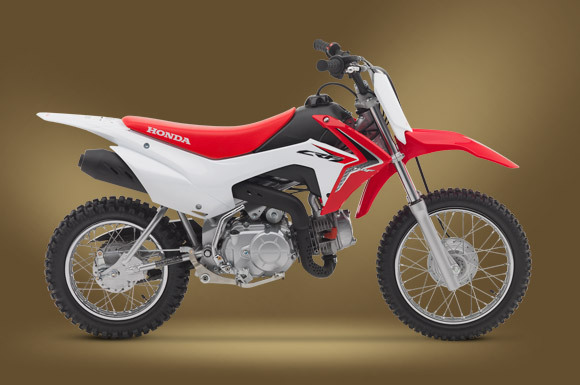 The CRF110F features a low seat height, modest size, and a four-speed transmission with an automatic clutch on par with the CRF70F that it replaces. The new 110cc powerplant is tuned to meet the needs of those new to riding, and with a new throttle-limiter feature it offers additional tuning options to suit a variety of riders. Also, the CRF110F gets a new, convenient electric starter. Toss in race-inspired styling evocative of the hot new CFR450R, and you have a great new option that expands the family of entry-level dirt bikes from Honda. About the same size as our CRF70F, the new CRF110F offers a bigger 110cc air-cooled engine that’s just as reliable and built to deliver the kind of power your young Red Rider needs. In addition, the new CRF110F features both an effortless electric starter and a kick starter as well. And it all teams up with our four-speed transmission with automatic clutch that’s been proven in thousands of bikes, so your riders never have to worry about stalling or a handlebar-mounted clutch. The CRF110F is a great off-road fun bike that your kids are going to love. And, better than that, they’re going to remember all the fun they had riding it—and with you—for the rest of their lives.